The film is a short drama based on the poem “The Raven” by Edgar Allan Poe. It is included in our program to illustrate the work of our stars Arthur V. Johnson, Robert Harron and Billy Bitzer. Arthur Johnson plays the role of the first publisher, who rejects the poem. A 15 y.o. Robert Harron plays the doorman, who directs the visitor to the right person. Strangely, no movie site gives Robert Harron credit for this film, so we will correct this overlook and include "Edgar Allan Poe" in his filmography. Barry O’Moore worries about Linda Arvidson by her bedside in "Edgar Allan Poe" (1909), directed by D. W. Griffith, cinematographer Billy Bitzer. 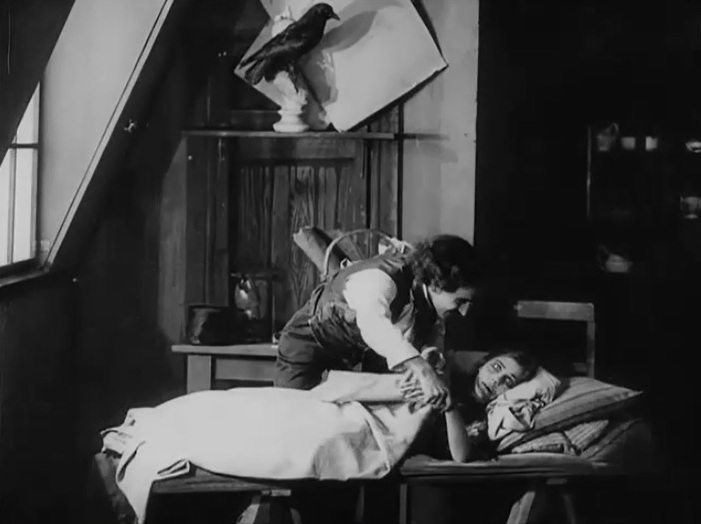 Barry O’Moore sees a raven and gets inspiration for a poem with Linda Arvidson by his side in "Edgar Allan Poe" (1909), directed by D. W. Griffith, cinematographer Billy Bitzer. 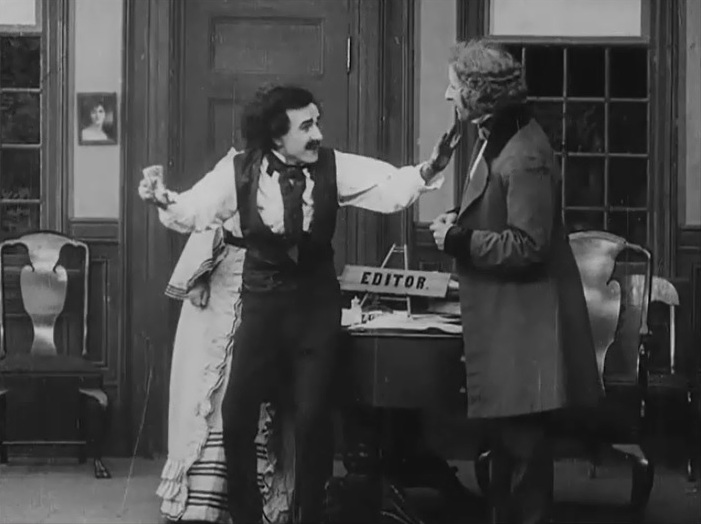 Arthur Johnson edits, Charles Perley muses and Robert Harron directs the visitor in "Edgar Allan Poe" (1909), directed by D. W. Griffith, cinematographer Billy Bitzer. 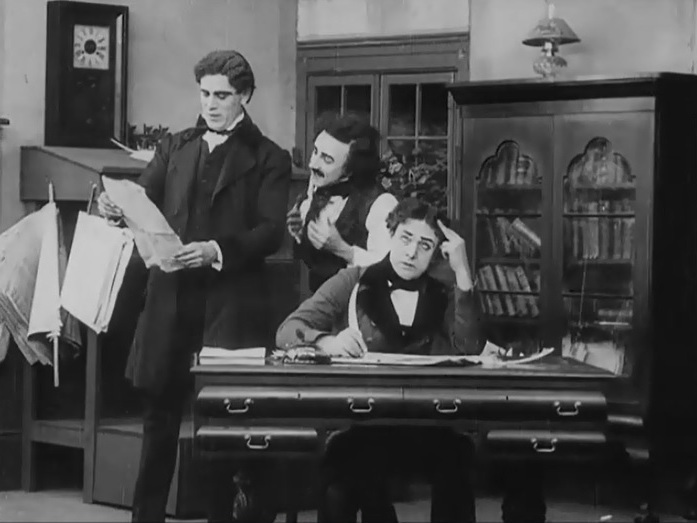 Arthur Johnson is distracted by Barry O’Moore as Charles Perley writes his poem in "Edgar Allan Poe" (1909), directed by D. W. Griffith, cinematographer Billy Bitzer. Arthur Johnson checks Barry O’Moore's poem as Charles Perley indulges in some more musing in "Edgar Allan Poe" (1909), directed by D. W. Griffith, cinematographer Billy Bitzer. Arthur Johnson rejects Barry O’Moore's poem as Charles Perley works in "Edgar Allan Poe" (1909), directed by D. W. Griffith, cinematographer Billy Bitzer. Barry O’Moore earns David Miles's interest as Anita Hendrie looks on in "Edgar Allan Poe" (1909), directed by D. W. Griffith, cinematographer Billy Bitzer. Barry O’Moore is ecstatic to receive some money from David Miles for his poem in "Edgar Allan Poe" (1909), directed by D. W. Griffith, cinematographer Billy Bitzer. Barry O’Moore has goodies for Linda Arvidson, not realizing that it is too late in "Edgar Allan Poe" (1909), directed by D. W. Griffith, cinematographer Billy Bitzer.